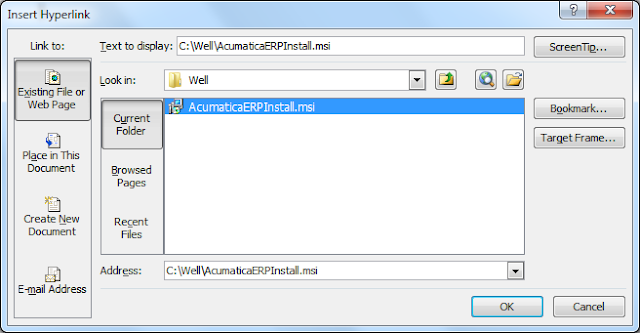 Acumatica Singapore: Creating Links to External Files. Creating Links to External Files. This article is about linking external files to Acumatica entities without uploading to the database. Document Management in Acumatica is great, but sometimes, customer may want to link files from existing third-party storage to Acumatica. 1. 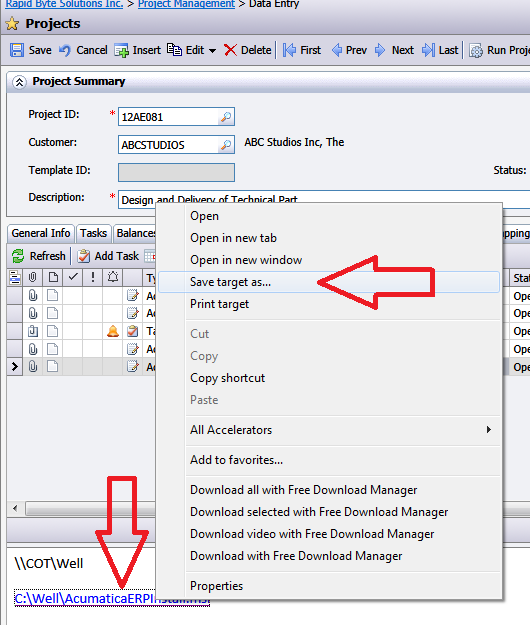 We can upload file into Acumatica entities, by just clicking on Attachment button. It is true for almost all the screens. We can attach files to each line of the grid as well. But this is not what our customer wants. 2. We can pass the link to existing file or document from Acumatica to the user. For example, we send link by e-mail then another user can paste it into the browser and access that file. And again this is not what we need. 3. 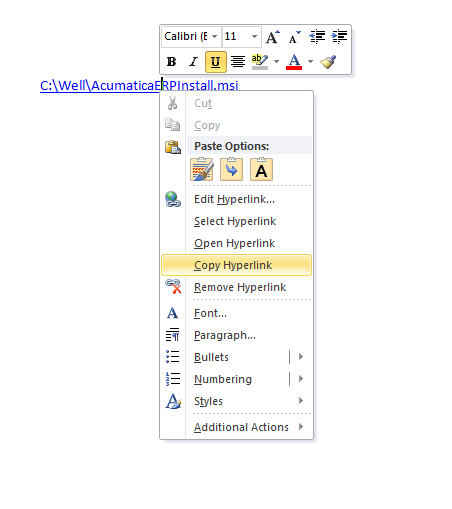 We do have an option to insert a link to a third party file of web site inside acumatica as well. This is what I wanted to describe in better details. For example I would like to attach external file, located at local area network resource, to my Project. Lets open an existing Project. Links are made via Activities, therefore we should navigate straight to Activities Tab. This way we can add simple text, but not the link. In order to add a link I will use Microsoft Word to create a hyperlink first. I need to create a link to a FILE, not FOLDER in order for the function to work. Now lets save the Activity and get back to the project Activity History screen. In order for the list to refresh just click on some other activity and get back to original one. It will refresh the NOTES area. See you on the Partner Meeting 4th October. Adding a Drop Down List (ComboBox).